Synopsis: IT WOULD TAKE MORE THAN A LITTLE LUCK TO BRING THEIR TEXAS HEARTS TOGETHER…. Trace McBride seemed as likely a candidate as any. An attractive widower raising three little girls who were fast becoming three little outlaws, Trace badly needed a woman’s loving touch. Jenny wasn’t altogether sure she knew how to get a man to propose marriage, but she was willing to take off her spectacles, let down her honey-blond hair, and even give flirtation a try. But when seduction turns into red-hot passion, Jenny will find herself risking everything–even her life–on the chance that she’ll be lucky in love..
My Thoughts: It dawned on me that I own series of books by authors that I’ve never read. This is the start of one them. I enjoyed this book very much (in spite of the fact that my copy was missing 30 pages and that the binding was skewed on another 10). Trace and Jenny were a great combination and I thought Ms. Dawson did an excellent job with the telling of their story. This tale had as much humor as it did heart which made it a wonderful reading experience for me. There were also several background characters that made this book so enjoyable ~ the McBride Menaces (Trace’s three daughters) would be at the front of this list. These girls have a gift for mischief and it was so fun reading about their exploits. They all three have stories in the Bad Luck Brides series and I can’t wait to find out how well they grew up. Verdict: This was Very Good. 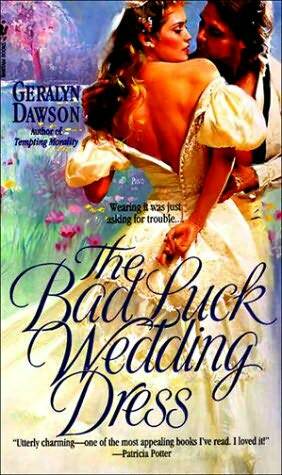 Next up will be Trace’s twin brother’s story, The Bad Luck Wedding Cake. I’m looking forward to reading about the further exploits of the McBride family.